Casbah Bob Bennett, Reviewer TV video frame, 2010 or 2011 (?). Bob Bennett was one of the original owners and a founder of the Casbah in San Diego. He was originally from Pittsburgh, PA, I believe, and I also think he told me his father was a cop when he was growing up there. I recently found this clip on my hard drive. It’s from and old cell phone file dump. I had been working a wedding shoot earlier that afternoon and wanted to sit in a room with people partying that wasn’t a reception where I had to take pictures. I must have shot this later in the night after drinking about four or five Tequila Sunrises, it was like 2010 or 2011, and maybe I was setting the buttons to take a cell phone photo at the time and shot it covertly under his radar because if I had asked him he probably would have said no, haha. 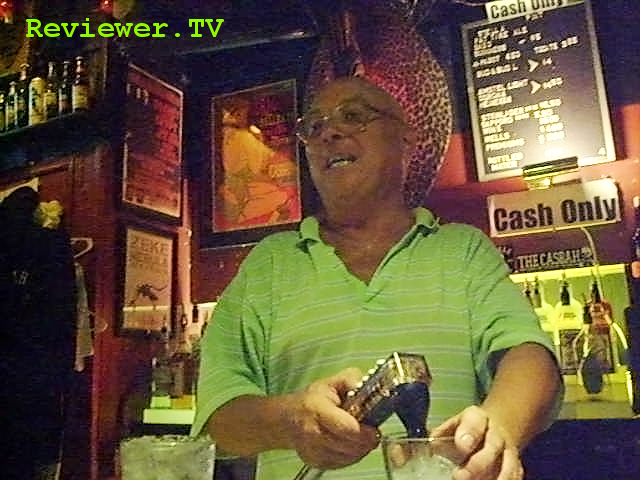 Never married, with no known children, Bob may be pouring soda in this clip but he mixed strong drinks at the Casbah back bar until he retired shortly before his death earlier this year in January, 2015. I definitely took a cab when I left on this night. I don’t remember the bands that played but if I recall it was a Friday or Saturday night and the place was crowded. Since I had a seat at the back bar I was reluctant to give it up. See you later, Bob. You were a good barman, host and entertainer.